The Mississippi Department of Education released a video in 2017 that shows how Oxford County school district is using a multi-tiered system of supports team to lower chronic absence. It also features the school district’s implementation of the Campaign for Grade-Level Reading approach to attendance as a strategy to help all of their students get to school every day. The 2016 video from the Mississippi Department of Education features research from Mississippi KIDS COUNT that shows how chronic absenteeism has an impact on student achievement. It includes best practices in two schools which are among those with the lowest chronic absenteeism rates in Mississippi. In April 2017 Mississippi KIDS COUNT released Empty Seats: Mississippi School Attendance Officers’ Perspectives on Chronic Absence. This web-based survey of school attendance officers in the state collected critical information about why children miss school and how school districts handle attendance issues. Thirty-two percent of respondents cited adverse events in the child’s home life as the most frequent cause of chronic absence. Mississippi KIDS COUNT released a policy brief, Moving Up: The Importance of Attendance in Addressing the Achievement in Mississippi, in May, 2016. Using a model conducted by the Denver Public school system (DPS), researchers looked at trends impacting students who fall into the “opportunity quartile," or the group of students who scored lowest on state achievement scores. The brief examined the "opportunity quartile" and the connection to attendance. An updated analysis of state-wide data by Mississippi KIDS COUNT, released in February 2016, found that chronic absence rates start high in kindergarten, decrease through elementary school years, and increase again in middle and high school. During the 2013/14 school year, 14% of kindergartners, 15% of 8th graders, and 36% of 12th graders were chronically absent. Based on the 2015 report that analyzed state and district-level data, Counting the Future used student-level data to investigate the effects of chronic absence on student outcomes. 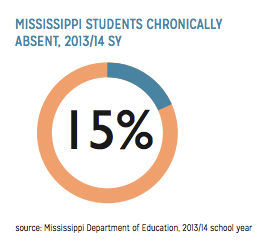 An analysis released in March 2015 showed that 15 percent of Mississippi public school students (74,299) were chronically absent during the 2013-14 school year. Absentee rates were high in kindergarten (14%), tapered off in early elementary years, and increased steadily throughout middle school and high school. The highest proportion was 36 percent in grade 12.Using data provided by the Mississippi Department of Education, researchers at Mississippi KIDS COUNT compared average daily attendance percentages to those of chronic absence in 152 of the state’s school districts. Despite an overall state average daily attendance rate of 93 percent, there were still 130 school districts with at least 10 percent of their students chronically absent and 11 districts with 20 percent or more. The Mississippi Department of Education (MDE) released school- and district-level chronic absence data for 2016-17 school year. The results show that 14.2 percent of Mississippi students were absent 10 percent or more of the time enrolled that year. The rate is slightly lower than the state’s first report of chronic absence in 2015, which revealed 15 percent of students were chronically absent in the 2013-14 school year. Download the Excel sheet with the chronic absence data for 2016-17 school year.